When you get to the page for our book click on the content button on the top left and then chose the chapter you want. You can scroll page to page. Click on the table of contents button and then move page to page with the next page button, which is on the bottom. The short time I played with them the HTML5 eBook felt easier for me. 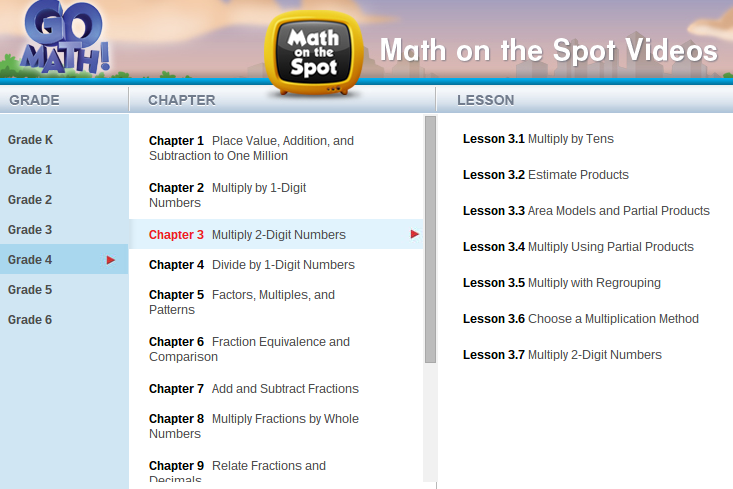 Go Math "Math on the spot videos"
Videos that will walk you through each lesson. Click on the grade and then the lesson. Thanks for coming to Mr. Grimm's class website.